The Tree of Life is a 2011 American experimental epic drama film written and directed by Terrence Malick and starring Brad Pitt, Sean Penn, and Jessica Chastain. The film chronicles the origins and meaning of life by way of a middle-aged man's childhood memories of his family living in 1950s Texas, interspersed with imagery of the origins of the known universe and the inception of life on Earth. After several years in development and missing 2009 and 2010 release dates, The Tree of Life premiered in competition at the 2011 Cannes Film Festival, where it was awarded the Palme d'Or. It ranked no. 1 on review aggregator Metacritic's "Top Ten List of 2011", and in January 2012 was nominated for three Academy Awards: Best Picture, Best Director, and Best Cinematography. The Tree of Life topped more critics' year-end lists for 2011 than any other film, with many declaring it a masterpiece. It has appeared in the 2012 Sight & Sound critics' poll of the world's top 250 films as well as BBC's poll of the greatest American films, one of the few 21st century works to be included in both. A mysterious, wavering light, resembling a flame, flickers in the darkness. Mrs. O'Brien recalls a lesson taught to her that people must choose to follow either the path of grace or the path of nature. In the 1960s or thereabouts, she receives a telegram informing her of the death of her son, R.L., aged nineteen. Mr. O'Brien is notified by telephone while at an airport. The family is thrown into turmoil. In the present day, the O'Briens' eldest son, Jack, is adrift in his modern life as an architect. One day he apologizes to his father on the phone for something he said about R.L. 's death. In his office, Jack begins reflecting; shots of tall buildings under the sky, Jack wandering in the desert, trees that stretch from the ground up to the sun high in their leaves, and scenes from his 1950s childhood all link together and lead back to the flame are seen. From the darkness the universe is born, the Milky Way and then the solar system form while voice-overs ask existential questions. On the newly formed Earth, volcanoes erupt and microbes begin to form and replicate. Sea life is born, then plants on land, then dinosaurs. In a symbolic first act of compassion, a dinosaur chooses not to eat a weakened creature that is lying on the side of a river bed. An asteroid tumbles through space and strikes the Earth, causing the Cretaceous–Paleogene extinction event. In a sprawling suburban neighborhood in the American South live the O'Briens. The young couple is enthralled by their new baby Jack and, later, his two brothers. When Jack reaches adolescence, he is faced with the conflict of accepting the way of grace or nature, as embodied by each of his parents. Mrs. O'Brien is gentle, nurturing, and authoritative, presenting the world to her children as a place of wonder. Mr. O'Brien is strict and authoritarian, and easily loses his temper as he struggles to reconcile his love for his sons with wanting to prepare them for a world he sees as corrupt and exploitative. He laments his decision to work in a power plant instead of pursuing his passion for music. He tries to get ahead by filing patents for various inventions. Jack's perceptions of the world begin to change after one of his boyhood companions drowns at the pool and another is burned in a house fire. He becomes angry at his father for his bullying behavior and begins to keep a running tally of Mr. O'Brien's various hypocrisies and misdeeds, lashing out at his mother for tolerating such abusive behavior. One summer, Mr. O'Brien takes a long business trip. While he is away, the boys enjoy unfettered access to their mother, and Jack experiences the first twinges of rebelliousness. Goaded by other boys his age, Jack commits acts of vandalism and animal abuse. He later trespasses into a neighbor's house and steals her sheer nightgown. Jack is confused and angered by his feelings of sexuality and guilty trespass. He throws the stolen lingerie into a river to rid himself of it. Mr. O'Brien returns home from his business trip. Shortly thereafter, the plant that he works at closes and he is given the option of relocating to work in an inferior position within the firm or losing his job. He and his family pack up to move to the new job location. He laments the course his life has taken, questioning whether he has been a good enough person. He asks Jack for forgiveness for his harsh treatment of him. In the present, adult Jack leaves work. Riding the elevator up, he experiences a vision of following a young girl across rocky terrain. Jack tentatively walks through a wooden door frame erected on the rocks and sees a view of the far distant future in which the sun expands into a red giant, engulfing the earth and then shrinking into a feeble white dwarf. Someone says "follow me" in the darkness, which is ended by the lighting of two candles. After emerging from rustic doors, Jack follows the girl and then a young version of himself across surreal landscapes. On a sandbar, Jack sees images of death and the dead returning to life. He is reunited with his family and all the people who populate his memory. His father is happy to see him. He encounters his dead brother, whom he brings to his parents. The parents are then seen saying goodbye to the young brother as he steps out of a home into a vast expanse. Accompanied by a woman in white and a young woman, Mrs. O'Brien looks to the sky and whispers, "I give him to you. I give you my son." Jack's vision ends and he leaves the building smiling, while nature returns to the surrounding buildings as the sky is reflected in them. In an October 2008 interview Jack Fisk, a longtime Malick collaborator, suggested that the director was attempting something radical. He also implied that details of the film were a close secret. In March 2009, visual effects artist Mike Fink revealed to Empire magazine that he was working on scenes of prehistoric Earth for the film. The similarity of the scenes Fink describes to descriptions of a hugely ambiguous project entitled Q that Malick worked on soon after Days of Heaven has led to speculation that The Tree of Life is a resurrection of that abandoned project. The namesake of the film is a large live oak tree that was excavated from a property a few miles outside Smithville. The 65,000-pound tree and root ball were trucked into Smithville and replanted. After nearly thirty years away from Hollywood, famed special effects supervisor Douglas Trumbull contributed to the visual effects work on The Tree of Life. Malick, a friend of Trumbull, approached him about the effects work and mentioned that he did not like the look of computer-generated imagery. Trumbull asked Malick, "Why not do it the old way? The way we did it in 2001?" Working with visual effects supervisor Dan Glass, Trumbull used a variety of materials for the creation of the universe sequence. "We worked with chemicals, paint, fluorescent dyes, smoke, liquids, CO2, flares, spin dishes, fluid dynamics, lighting and high speed photography to see how effective they might be," said Trumbull. "It was a free-wheeling opportunity to explore, something that I have found extraordinarily hard to get in the movie business. Terry didn't have any preconceived ideas of what something should look like. We did things like pour milk through a funnel into a narrow trough and shoot it with a high-speed camera and folded lens, lighting it carefully and using a frame rate that would give the right kind of flow characteristics to look cosmic, galactic, huge and epic." The team also included Double Negative in London. Fluid-based effects were developed by Peter and Chris Parks, who had previously worked on similar effects for The Fountain. A column in The New Yorker noted that the film credited Thomas Wilfred’s lumia composition Opus 161, and that this was the source of the "shifting flame of red-yellow light" at the beginning and the end. In March 2009, Empire magazine's website quoted visual effects supervisor Mike Fink as saying that a version of the film will be released for IMAX cinemas along with two versions for traditional cinemas. The IMAX film has been revealed to be Voyage of Time, a documentary expanding on the 'history of the universe' scenes in The Tree of Life, which the producers decided to focus on releasing at a later date so as not to cannibalise its release. It is set to be released by Broad Green Pictures. The Tree of Life Original Motion Picture Soundtrack by Alexandre Desplat was released in 2011 by Lakeshore Records. Although billed as the movie soundtrack, only a few minutes of the album's music are heard in the film. Early reviews for The Tree of Life at the 2011 Cannes Film Festival were polarized. After being met with both boos and applause at its premiere at the 2011 Cannes Film Festival, the film received mixed early reviews. The film went on to be awarded the prestigious Palme d'Or. Two of the film's producers, Bill Pohlad and Sarah Green, accepted the prize on behalf of the reclusive Malick. The Tree of Life is the first American film to win the Palme d'Or since Fahrenheit 9/11 in 2004. The head of the jury, Robert De Niro, said it was difficult to choose a winner, but The Tree of Life "ultimately fit the bill". De Niro explained, "It had the size, the importance, the intention, whatever you want to call it, that seemed to fit the prize." The film won the 2011 FIPRESCI (International Federation of Film Critics) Big Prize for the Best Film Of the Year. The award was presented on September 16, during the opening ceremony of the 59th San Sebastián International Film Festival. Malick released a statement of thanks for the award. On November 28, it was announced that the film had won the Gotham Award for Best Feature, shared with Beginners. The Tree of Life has since garnered critical acclaim and holds an 84% rating on Rotten Tomatoes, based on 256 reviews. The site's consensus is that "Terrence Malick's singularly deliberate style may prove unrewarding for some, but for patient viewers, Tree of Life is an emotional as well as visual treat." At Metacritic which assigns a weighted mean rating out of 100 reviews from film critics, the film has a rating score of 85 based on 43 reviews, indicating "universal acclaim". Roger Ebert gave the film four stars of four and wrote, "The Tree of Life is a film of vast ambition and deep humility, attempting no less than to encompass all of existence and view it through the prism of a few infinitesimal lives. The only other film I've seen with this boldness of vision is Kubrick's 2001: A Space Odyssey and it lacked Malick's fierce evocation of human feeling. There were once several directors who yearned to make no less than a masterpiece, but now there are only a few. Malick has stayed true to that hope ever since his first feature in 1973." The following year, Ebert ranked The Tree of Life one of the 10 greatest films ever made in Sight & Sound's 2012 critics' poll. The New Yorker said a "seraphic strain" in Malick's work "hits a solipsistic high" in The Tree of Life. "While the result will sound to some like a prayer, others may find it increasingly lonely and locked, and may themselves pray for Ben Hecht or Billy Wilder to rise from the dead and attack Malick’s script with a quiver of poisonous wisecracks," the magazine's reviewer said. Some religious reviewers welcomed the spiritual themes of the film. For instance, Catholic author and now auxiliary bishop of Los Angeles Fr. Robert Barron, reviewing The Tree of Life for a Chicago Tribune blog, noted that "in the play of good and evil, in the tension between nature and grace, God is up to something beautiful, though we are unable to grasp it totally...“Tree of Life” is communicating this same difficult but vital lesson." Rabbi David Wolpe says "that Terrence Malick's new film "Tree of Life" opens with a quotation from Job. That quotation holds the key to the film and in some sense, the key to our attitude toward life." The film appeared on over 70 critics' year-end top ten lists, including 15 first-place rankings. 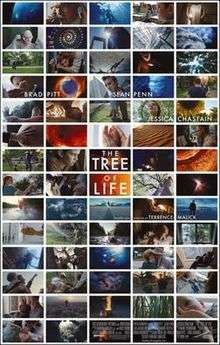 The Tree of Life was voted best film of 2011 in the annual Sight & Sound critic poll, earning one and a half times as many votes as runner up A Separation. The film also topped the critics poll of best released film of 2011 by Film Comment, and the indieWire annual critics survey for 2011, as well as The Village Voice/LA Weekly Film Poll 2011. In 2015, the film was named as one of the top 50 films of the decade so far by The Guardian. In 2012, 16 critics, including Roger Ebert, included it as one of their 10 votes for Sight & Sound; this placed it at #102 in the final list (making it the fourth film on the list which had been released since the year 2000, behind Wong Kar-wai's In the Mood for Love, Edward Yang's Yi Yi, and David Lynch's Mulholland Drive). The film also received five votes in the directors' poll (placing it at #132). The Tree of Life ranked seventh on the British Broadcasting Corporation (BBC)'s 100 Greatest Films of the 21st Century in August, 2016. The list was compiled by polling 177 film critics from around the world. ↑ "THE TREE OF LIFE (12)". British Board of Film Classification. 2011-06-10. Retrieved 2013-06-01. ↑ "The Tree of Life". The Numbers. ↑ "The Tree of Life (2011)". Box Office Mojo. October 27, 2011. Retrieved January 26, 2012. ↑ "Film Critic Top 10 Lists - Best of 2011". Metacritic. Retrieved 2014-06-03. ↑ "Best of 2011". CriticsTop10. Retrieved December 1, 2016. 1 2 "The Tree of Life (2010) | BFI". Explore.bfi.org.uk. Retrieved 2014-06-03. ↑ Desowitz, Bill (June 1, 2011). "Giving VFX Birth to Tree of Life". Animation World Network. Retrieved November 16, 2011. ↑ Abele, Robert (September 9, 2009). "Pohlad holds out hope". Variety. Retrieved October 26, 2010. 1 2 Zeitchik, Steven; John Horn (January 24, 2012). "Oscars 2012: How will 'Tree of Life' be represented?". Los Angeles Times. Retrieved January 26, 2012. The Academy of Motion Picture Arts and Sciences said it had yet to determine which producers would be eligible for the best picture prize....it's likely that Bill Pohlad and Sarah Green will be two of the producers. Pohlad, who financed the film, had been developing it with Malick for about a decade, while Green is Malick's longtime producer and close confidant. The third slot could go to one of three people – Grant Hill, a producer who was involved with it early on; Brad Pitt, who came on to produce and then star; or Dede Gardner, Pitt's producing partner. 1 2 "The Tree of Life: A Conversation With Producer Dede Gardner". thehdroom.com. October 13, 2011. Retrieved January 26, 2012. ↑ Bhushan, Nyay (August 31, 2005). "Percept finds 'Life' with Malick feature". The Hollywood Reporter. Archived from the original on May 3, 2008. Retrieved March 29, 2008. ↑ Naval-Shetye, Aakanksha (May 17, 2006). "Guess who's coming to town!". Times of India. Retrieved October 26, 2010. ↑ "Arrival in The New World: Extended Cut". Blogtalkradio.com. October 29, 2008. Retrieved January 26, 2012. ↑ Lim, Dennis (January 6, 2008). "If You Need a Past, He's the Guy to Build It". The New York Times. 1 2 Exclusive: Malick's Tree Of Life. Empire. Retrieved December 22, 2010. ↑ McNary, Dave (April 15, 2008). "Chastain to star opposite Pitt in 'Tree'". Variety. Retrieved April 19, 2008. ↑ Garcia, Chris (March 25, 2008). "Gracia, Chris. "'Tree of Life' uprooted, briefly". ''austin360.com''". Austin360.com. Retrieved January 26, 2012. ↑ "The Tree of Life (2011)". IMDb. Retrieved January 12, 2015. ↑ Wilonsky, Robert (December 16, 2010). "Terrence Malick Shot Tree of Life All Over Texas. Including, Turns Out, in Downtown.". DallasObserver.com. Retrieved January 26, 2012. ↑ "Ingram, Emily. "Part of downtown Waco shut down for film shoot". wacotrib.com". Retrieved January 26, 2012. ↑ Tree of Life. February 16, 2008. ↑ Planting the Tree of Life. February 17, 2008. ↑ Keegan, Rebecca (April 25, 2010). "TCM Festival: Hollywood Visionary Douglas Trumbull Working on Terrence Malick Movie". Vanity Fair. ↑ Hart, Hugh (June 17, 2011). "Video: Tree of Life Visualizes the Cosmos Without CGI". Wired (magazine). ↑ "Animation World Network: Giving VFX Birth to Tree of Life". ↑ Zinman, Gregory (2011-06-27). "Lumia: Thomas Wilfred's Opus 161 (1965-66)". The New Yorker. New York, NY: Condé Nast. Retrieved 2015-10-11. ↑ Horn, John (May 25, 2011). "Terrence Malick looks to IMAX to extend 'Tree of Life' explorations". Los Angeles Times. Retrieved May 28, 2011. ↑ Fleming Jr, Mike (February 3, 2015). "IMAX, Broad Green Sign On As Distribs Of Terrence Malick's 'Voyage Of Time'". Deadline.com. Retrieved April 10, 2016. ↑ "TriPictures picks up Summit's Tree of Life, Letters to Juliet". Screen Daily. May 22, 2009. Retrieved October 26, 2010. ↑ Fleming, Michael (August 6, 2009). "Pohlad, Berney unveil Apparition". Variety. ↑ Thompson, Anne (October 15, 2009). "Tree of Life Will Not Open in 2009". Indiewire. 1 2 Thompson, Anne (April 20, 2010). "Cannes Updates: Fortnight, Critics Week, Carlos, Tree of Life". Indiewire. Retrieved October 26, 2010. ↑ Davis, Edward (April 15, 2010). "Don't Get Those 'Tree of Life' Hopes Up for Cannes 2010". The Playlist. Retrieved October 26, 2010. ↑ Fleming, Michael (May 11, 2009). "Berney Exit Blindsides Apparition". Deadline. ↑ Fleming, Mike (June 30, 2010). "Apparition Restructures With 60% Staff Cut". Deadline. Retrieved October 26, 2010. ↑ Fleming, Michael (September 7, 2010). "Apparition Cuts Staff, Nears 'Tree of Life' Distribution Deal". Deadline. Retrieved October 26, 2010. ↑ Thompson, Anne (September 13, 2010). "Waiting for Malick: Which Film Fest Will Debut Tree of Life?". Retrieved October 26, 2010. ↑ "Announced: Fox Searchlight Acquires Terrence Malick's TREE OF LIFE". Fox Searchlight Pictures. September 9, 2010. Retrieved September 9, 2010. ↑ Jagernauth, Kevin (October 22, 2010). "'The Tree Of Life' Gets May 27, 2011 Release Date". indieWire. Retrieved October 22, 2010. 1 2 3 O'Hara, Helen (March 28, 2011). "The Tree of Life has A UK Release Date". Empire. Retrieved April 2, 2011. ↑ "Rules & Regulations 2011". Retrieved April 2, 2011. ↑ Wells, Jeff (March 28, 2011). "UK Tree of Life Release: Shocker or Snafu?". Hollywood Elsewhere. Retrieved April 2, 2011. ↑ Thompson, Anne (March 28, 2011). "Tree of Life Will Not Open in the U.K. Before Cannes After All, Gets New Poster". Indiewire. Retrieved April 2, 2011. ↑ Thompson, Anne (March 31, 2011). "Summit Takes Icon UK to a Los Angeles Arbitration Tribunal Over Tree of Life". Indiewire. Retrieved April 2, 2011. ↑ Wells, Jeff (March 28, 2011). "Icon Kicked to Curb". Hollywood Elsewhere. Retrieved April 2, 2011. ↑ "New Tree Of Life Featurette Online and finally gets a UK release date". Empire. June 9, 2011. ↑ "The Tree of Life Blu-ray". Blu-ray.com. Retrieved January 26, 2012. 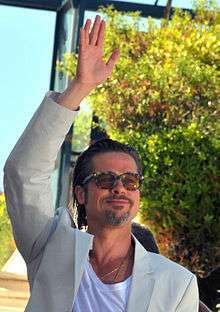 ↑ "Brad Pitt, Terrence Malick's "Tree of Life" booed in Cannes". May 16, 2011. Retrieved November 5, 2011. ↑ Ditzian, Eric (May 16, 2011). "'The Tree Of Life': The Cannes Reviews Are In! Director Terrence Malick's first film since 2005 is getting widely mixed reactions after its Cannes premiere.". Mtv. Retrieved January 26, 2012. 1 2 3 4 Germain, David (May 22, 2011). "Malick's 'Tree of Life' wins top Cannes fest honor". Forbes. Forbes publishing. Retrieved May 22, 2011. ↑ Gritten, David (May 24, 2011). "The Tree of Life demands to be seen and experienced". The Daily Telegraph. UK. Retrieved May 27, 2011. ↑ "FIPRESCI, the International Federation of Film Critics". ↑ "Sean Penn Has Issues But Recommends 'Tree Of Life'; Malick Says 'Burial' Is "Rushing Toward A Mix"". The Playlist. August 22, 2011. Retrieved November 5, 2011. ↑ Szalai, Georg (November 28, 2011). "Gotham Awards 2011: 'Tree of Life', 'Beginners' Tie for Best Feature". The Hollywood Reporter. Retrieved November 28, 2011. ↑ "The Tree of Life (2011)". Rotten Tomatoes. ↑ "The Tree of Life". Metacritic. ↑ "The Tree of Life". Chicago Sun-Times. June 2, 2011. ↑ "The greatest films of all time". Chicago Sun-Times. April 26, 2012. ↑ Lane, Anthony (May 30, 2011). "Time Trip". The New Yorker. Retrieved February 24, 2015. ↑ "The Tree of Life". The Guardian. London. December 16, 2010. ↑ Todd McCarthy (May 16, 2011). "The Tree of Life: Cannes Review". The Hollywood Reporter. ↑ Justin Chang (May 16, 2011). "Cannes Competition: The Tree of Life". Variety. ↑ Peter Travers (May 26, 2011). "The Tree of Life". Rolling Stone. Retrieved January 26, 2012. ↑ "The Tree Of Life Review". Total Film. Retrieved July 21, 2011. ↑ Corliss, Richard (December 7, 2011). "The Top 10 Everything of 2011 – The Tree of Life". Time. Retrieved December 13, 2011. ↑ Hibbs, Thomas S. (2011-07-05). "A Story From Before We Can Remember: A Review of Tree of Life | Web Exclusives | Daily Writings From Our Top Writers". First Things. Retrieved 2014-06-03. ↑ Ian Marcus Corbin (2012-06-05). "Points of Light". The New Atlantis. Retrieved 2014-06-03. ↑ Hart, David Bentley (22 July 2011). "Seven Characters in Search of a Nihil Obstat". First Things. ↑ Leithart, Peter J. (2013). Shining Glory: Theological Reflections on Terrence Malick's Tree of Life. Eugene, Oregon: Cascade Books. ISBN 978-162032-413-4. ↑ "The Seeker: Tree of Life glorifies God". Newsblogs.chicagotribune.com. 2011-05-25. Retrieved 2014-06-03. ↑ "The Religious Meaning of Malick's 'Tree of Life'". The Huffington Post. Retrieved January 12, 2015. ↑ Sukhdev Sandhu (July 7, 2011). "The Tree Of Life, review". The Daily Telegraph. London. ↑ Lee Marshall. "The Tree Of Life". Screen Daily. ↑ Stephanie Zacharek. "CANNES REVIEW: Tree of Life Is All About Life; But Does Malick Care Much for People?". Movieline. ↑ Zeitchik, Steven (June 22, 2012). "David Lynch says he doesn't have any ideas for a new film". Los Angeles Times. ↑ "Film Critic Top 10 Lists – Best of 2011". Metacritic. Retrieved January 26, 2012. ↑ Lodge, Guy (November 28, 2011). "'Tree of Life' easily tops Sight & Sound's Best of 2011 poll". In Contention. Retrieved November 29, 2011. ↑ Kemp, Nicholas (December 16, 2011). "Film Comment". Retrieved December 16, 2011. ↑ "indieWIRE". Retrieved December 19, 2011. ↑ "LA Weekly". Retrieved December 21, 2011. ↑ Bradshaw, Peter (5 January 2015). "Peter Bradshaw's top 50 films of the demi-decade". The Guardian. Retrieved 29 April 2015. ↑ "The 21st Century's 100 Greatest Films". BBC Culture. 23 August 2016. Retrieved 16 August 2016. ↑ "AACTA Awards winners and nominees" (PDF). Australian Academy of Cinema and Television Arts (AACTA). January 31, 2012. Retrieved February 4, 2012. ↑ "Oscar 2012 winners – The full list". The Guardian. UK. February 27, 2012. Retrieved March 28, 2012. ↑ "Nominees and Winners for the 84th Academy Awards". Academy Awards of Motion Picture Arts and Sciences (Oscars). Retrieved March 28, 2012. ↑ "The American Society of Cinematographers Nominates". The ASC. January 11, 2011. Retrieved January 15, 2012. ↑ "Central Ohio Film Critics Association (COFCA) - 2011 Awards". cofca.org. Retrieved December 9, 2012. ↑ Feinberg, Scott (September 12, 2012). "Hollywood Film Awards to Honor Judd Apatow and 'Beasts of the Southern Wild' Actress (Exclusive)". The Hollywood Reporter. Retrieved November 28, 2012.